A young man who went into dairy farming after ”falling in with the wrong crowd” at school is earning accolades. Jack Raharuhi (24) has been named the West Coast-Top of the South Dairy Manager of the Year. He was presented with $4680 in prizes at the recent New Zealand Dairy Industry Awards regional awards dinner in Shantytown. Mr Raharuhi, who manages a 482ha Landcorp property in Westport with 1150 cows, began milking through a Gateway programme at Buller High School nine years ago. He has worked his way up the industry, now overseeing a second-in-charge programme that involves training and mentoring others in the Landcorp cluster. 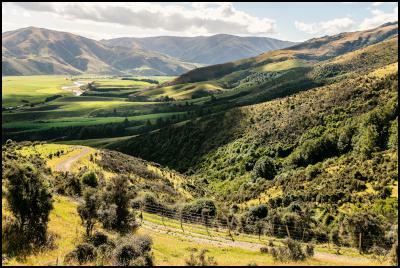 . .
“These beef and sheep farming stations are shining examples of the commitment Māori farmers have to sustainably developing their land for future generations. I’m proud to acknowledge and celebrate the key role Māori play in New Zealand’s primary industries,” says Mr Guy. “The asset base of the Māori economy is worth over $42 billion, most of which is strongly focussed on the primary industries. Māori collectively own 40% of forestry land, 38% of fishing quota, and 30% of lamb production, to name just a few examples. . .
It’s a long way from the Seychelles to Toko Mouth. The path to farm ownership for coastal South Otago farmer Simon Davies has been an interesting one, including working in the seafood industry both in New Zealand and abroad. Mr Davies (45) and his wife Joanna, with their two young daughters Georgina (3) and 7-month-old Juliette, farm Coombe Hay, a 750ha sheep and beef property boasting spectacular sea views. Toko Mouth, 50km south of Dunedin and 15km southeast of Milton, is at the mouth of the Tokomairiro River and has about 70 holiday homes. . .
Minister for Primary Industries Nathan Guy has welcomed the launch of a new tool to monitor drought in New Zealand’s regions. Developed by NIWA with the support of the Ministry for Primary Industries, the New Zealand Drought Index uses the best scientific information available to determine the status of drought across the country. It is a tool to acknowledge the onset, duration and intensity of drought conditions. “Until now there hasn’t been one definitive definition of a drought,” says Mr Guy. “Applying the latest scientific knowledge and technology like this index does, helps us to know exactly what is happening and can better inform producers, agri-businesses, councils and the Government to make the right decisions at the right time.” . . The Beef + Lamb New Zealand Farmer Council has elected Marton farmer, William Morrison as its next national chairman. Morrison replaces retiring King Country farmer, Martin Coup who has been the chairman since 2012. The Beef + Lamb New Zealand Farmer Councils are aligned to the organisation’s geographic electorates and they were established in 2010 as a network for guiding and advising Beef + Lamb New Zealand in identifying farmers’ extension and research and development needs. . .
One of Southland’s largest farming stations is on the market for the first time in 40 years. Strong interest is expected in the sale of Glenlapa Station, a significant property encompassing 5271 hectares of prime pastureland in Northern Southland. The expansive station has a tremendous capacity of more than 20,000 stock units, making it one of the largest and most successful farms in the region. New Zealand Sotheby’s International Realty sales associate Russell Reddell says it’s uncommon for a property of this magnitude to be up for public sale. . . The latest DairyNZ science and innovation will be revealed at Farmers’ Forum events across the country in May. A selection of science topics will feature at the regional forums, free to farmers, with DairyNZ staff summarising key research. Session one, ‘Are you making money from milk or milk from money?’, will look at the results of DairyNZ’s farm systems research into the profitability of marginal milk (the milk produced after fixed costs are paid). In response to debate around which farming system is most profitable, DairyNZ has assessed the cost of marginal milk from data analyses and farm systems research. The findings will be presented to help farmers consider marginal milk in their decision making. . . Speaking at the Wood Processors & Manufacturers Association of New Zealand (WPMA) and Property Council New Zealand Tall Timber Buildings seminar last week, Mr Patterson questioned why, given New Zealand’s ample timber resources, there is not greater use of CLT in our construction sector. . .
(BusinessDesk) – New Zealand lamb meat prices advanced last month on lower supplies but analysts expect the uplift will be temporary due to weak demand in the UK market, where around two thirds of the country’s lamb legs are exported. The benchmark CKT price for a leg of lamb in the UK rose to 4.20 British pounds per kilogram in September, from 4.10 pounds/kg in August and 3.40 pounds/kg in September last year, according to AgriHQ data. In New Zealand dollar terms, returns were $7.51/kg in September, from $7.41/kg in August, and compared with $8.04/kg a year earlier. In New Zealand, the average price from local meat processors lifted to $5.80/kg, from $5.68/kg in August,and compared with $6.05/kg a year earlier, AgriHQ said. . .
German consumers are taking a liking to New Zealand hereford beef, with demand growing in a market traditionally dominated by pork and poultry. Fuelling that demand is the cattle’s grass fed diet and New Zealand’s outdoor farming style, importer Christian Klughardt says. Klughardt and his brother, Oliver, run HP Klughardt, a family business started by their father in 1968. They have bought lamb and venison from Silver Fern Farms (SFF) and its predecessor PPCS for about 30 years. . .
CellSense is an automated in-line sensor providing farmers with a live somatic cell count (SCC) resultwithin two minutes of cupping the cow. The new CellSense Connected app sends the SCC results straight to farmers’ smart devices. Data is presented in an easy-to-use format on the farmers’ devices (phones and tablets), allowing them to assign a SCC result to a cow during milking. This means farmers can view reports at their convenience and use them to aid dry off decisions. A flashing light system in the milking shed is an optional extra that alerts farmers to which cows in the herd have a high SCC. . .
“This is a significant step forward in freshwater management in New Zealand, and will enhance our research capabilities and facilities to address future management of our freshwater resources and environments,” Mr Joyce says. “The Joint Institute will be a world-leading centre for interdisciplinary freshwater research and teaching. It will build capability and capacity across the sciences, engineering, management, law, economics policy, mātauranga Māori and education, with the aim of delivering greater economic, social, cultural and environmental benefits from and for freshwater. . .
More than a million people used the New Zealand Cycle Trail last year, generating around $37 million in economic benefits for local communities, according to a new report released today by Prime Minister and Minister of Tourism John Key. The evaluation the New Zealand Cycle Trail, includes an independent cost benefit analysis showing that for every dollar attributable to construction and maintenance of the trails, approximately $3.55 of benefits was generated. “The New Zealand Cycle Trail has been very effective in attracting high-value visitors to our regions,” says Mr Key. . . Deer breeders who want to select deer with natural resistance to internal parasites may now do so. However, they’re taking a punt, as research to find out whether – or how – resistance is linked to growth rates and parasite levels in deer won’t be completed until late next year. Resistance levels are scored using a saliva test that measures the antibodies triggered when animals ingest internal parasites. Dubbed CARLA, short for carbohydrate larval antigens, the test was developed by AgResearch scientists for the sheep industry, where CARLA breeding values (BVs) are now a routine part of genetic selection. . .
Farmer Rayawa (on horseback) observes as his road is upgraded. Small to medium scale crop farmers living along Lutukina Road in the Macuata Province are now able to get their produce to markets faster and with their crops undamaged since their road was recently repaired by Fulton Hogan Hiways. 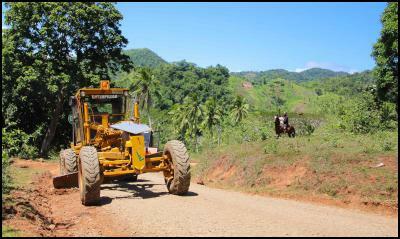 FHH is contracted by Fiji Roads Authority to maintain the unsealed and sealed road networks in the Northern division. Running through green terrain, Lutukina Road is located off the Labasa/Nabouwalu highway. It is 45 kilometres from Labasa Town and six kilometres from Dreketi. . . The Ministry for Primary Industries (MPI) is cautioning farmers not to plant left-over seed from any of the six lines of fodder beet seed imported last year and known to be contaminated with velvetleaf. MPI is working with industry players and regional councils to manage the incursion of the pest weed resulting from the importation of the contaminated seed. Response Incident Controller David Yard says there are hundreds of properties around New Zealand that have velvetleaf on them and we don’t want any more. “MPI has banned the importation of any of the affected lines, but we believe there are likely to be farmers out there who bought contaminated seed lines last year and could have left-over seed in their sheds. . . Continued investment in facilities and infrastructure has led to the most successful winter season on record for Cardrona Alpine Resort this year. Cardrona’s previous skier day record has been smashed by over 30,000 visits this year – a sign of growth in both the snow sports and local tourism industries. Investing in key areas such as carparking and the Valley View base area, along with a focus on minimising pinch points, has created a more even spread of capacity. Continual investment in terrain management including the SnowSat system, snowmaking capacity and grooming fleet has created a more stable, season-long product. The entire resort was open top to bottom on Opening Day June 11, including Valley View Quad for the first time in the lift’s history. Early snowfall, increased snowmaking capacity and tactical terrain management saw the resort fully operational from day one. . .